A 4-day training on Conduct and Management of Field Trials and Seed Production of Open-pollinated and Hybrid Varieties was held 15-19 August, at IITA, Ibadan for representatives from the Anglophone partner countries of the Stress Tolerant Maize for Africa (STMA) Project. 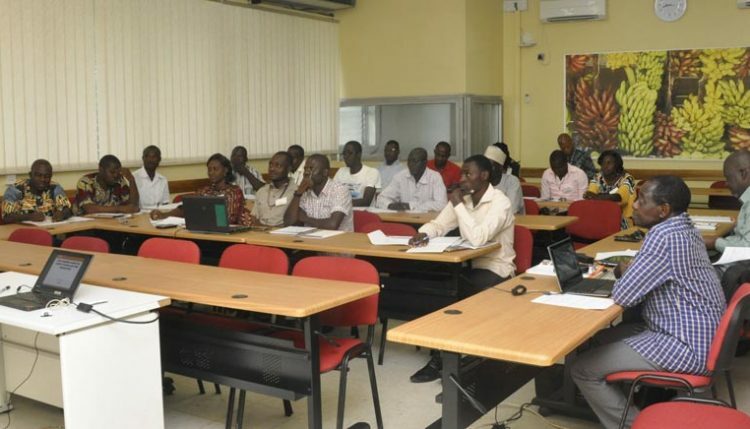 The training aimed at upgrading the technical capabilities and skills of field technicians, seed specialists of public institutions, and production managers of seed companies in the Conduct and Management of Field Trials and the Techniques of Quality Maize Seed production, particularly hybrid seed. During the training, the participants from Ghana and Nigeria were briefed on the major achievements of the Drought Tolerant Maize for Africa (DTMA) Project which has now metamorphosed to STMA. DTMA witnessed the release of more than 230 maize hybrid varieties and open-pollinated varieties possessing drought tolerance and other desirable traits. It also produced enough seeds to benefit over 5.7 million households representing nearly 45 million people in 2014 alone. Speaking at the training, Baffour Badu-Apraku, an IITA Maize breeder, explained that the training was necessary to instill a better understanding of the demands of the STMA procedures to participants. “…What we teach them during the training course, is very important, 40% of the course time will be devoted to hands-on experience. This will ensure a full understanding of maize variety testing and seed production,” Badu-Apraku said. Michael Abberton, IITA Deputy Director, Research for Development West Africa, welcomed the participants, and wished them a successful course. He went on to highlight the importance of maize and of seed systems as a key component of the value chain. “Maize is not only a major food crop, and important for food security, but also it is used as a key input in animal feed industries, and local brewing. The crop has become a major source of household incomes and provides employment to input dealers, and other auxiliary services providers,” Abberton stated. A total of 30 participants from Ghana (10) and Nigeria (20), including four women, took part in the course. Course presentations were in the form of lectures, demonstrations, practical sessions, and assignments. Resource persons for the course comprised Baffour Badu-Apraku, the course coordinator, Tahirou Abdoulaye, Outcome/Impact Socioeconomist for West Africa; Silvestro Meseka, IITA Maize breeder; Adegoke Adepoju, International Trials Manager; and Profs M.A.B. Fakorede, Sola Ajayi, and Adebayo Akinola of the Obafemi Awolowo University (OAU), Ile-Ife. Copies of a new publication by IITA maize scientists on the Conduct and Management of Maize Field Trials, Strategies for Sustainable Maize Seed Production in West and Central Africa, and Building Partnerships and Encouraging Innovation for Sustainable Maize Production were distributed to the course participants. At the end of the training course, Prof Fakorede, counseled the participants to use what they had benefited wisely. Certificates were issued to the participants after the training course. The STMA project is coordinated by the International Maize and Wheat Improvement Center (CIMMYT) and IITA. It is funded by the Gates Foundation and the United States Agency for International Development, (USAID).